​What a fun filled year of learning it has been!! Over the past 2 weeks the 1/2 classes have been doing some outstanding learning. In Maths, we have been exploring 2D and 3D shapes, in particular looking at their features. Their features are faces, edges and corners/vertices. We discovered that shapes are all around us and that we can create shapes using multiple different shapes. We also investigated and discovered which 3D shapes could roll, slide and be stacked. What shapes can you find in your backyard? In Reading, we have been working hard on making text-to-world connections. This was a fun way to learn interesting things about the world around us whilst strengthening our comprehension skills and ability to understand what we are reading. We have also been exploring the interesting adjectives in our books, which help us by giving us extra details about the nouns in our books. Adjectives also make our books more enjoyable and interesting to read. In Writing, we have also been trying to use interesting adjectives and juicy words in our writing to help engage our reader. We have all been given the opportunity to show all we have learnt un writing by following the Writing Cycle to create a writing piece in a text type of our own choice. There have been poems, procedural texts, picture storybooks, letters and more. To end our Inquiry unit on ‘How Beliefs Influence Our Celebrations’ we have chosen a celebration we have explored and we have begun to plan an invitation for it. The celebrations we have explored this term have been Thanksgiving, Diwali, St. Patrick’s Day, Hanukkah and Chinese New Year. After we have planned our invitation we will publish it and set it out like a real invitation including all the important information. We hope you have enjoyed the year as much as we have. Have fun in the last week and couple of days. Have a safe and happy holidays. We look forward to seeing all your smiling faces again next year. From Mrs Marinelli and the 1/2 Team. P.S. We are wild about learning. It has been a busy time in the 1/2 team, gearing up for the end of the year! In Maths we have been learning about Place Value and Addition and Subtraction. This has involved representing just right numbers in a variety of ways such as: ordering numbers form smallest to largest, writing them in standard, word and expanded forms and placing them on number lines. We've been building our ability to read worded, multi-step addition and subtraction problems and solve them. Stay tuned to Compass for your child's results from our place value assessment task which will be uploaded to the site soon. This means you get faster feedback about their performance than waiting for the end of semester report. During Reader's Workshop, we have continued to work on our Grammar Books, investigating homographs and homophones, plurals and onomatopoeia. Students were really engaged in making their books and they look fantastic! In the following week we have been making lots of text to text and text to world connections by reading about a range of unfamiliar celebrations such as St Patrick's Day, Thanksgiving and Diwali. Using the iPads we record what we have learnt about these celebrations and compare them with each other on the app Poplet. This also ties into our work in Inquiry on Celebrations. Students have been immersed in different types of poems and drafted some of their own. Taking these drafts, students have worked through the final phases of the Writing Cycle, revising, editing and publishing them into poetic masterpieces! In Inquiry, we have been exploring some of the less-familiar celebrations mentioned above and beginning to complete some crafty activities to enhance our learning! ​What a busy two weeks it has been. In Maths, we have deepened our exploration into the measurement of mass and capacity. Using different and new strategies to measure which is heavier; by hefting and looking at the formal units of gram, kilograms and tonnes. As well as measuring capacity by; finding out which container can hold more and measuring water using litres and millilitres. This week we revisited time and broadened our focus to reading different digital and analogue times. We have worked on o’clock, half past, quarter past, quarter to and minute times, as well as identifying times throughout the day and ordering them. In reading, the grade 1/2’s have been looking into the structures and features different texts have and how we can identify what type of text we are reading. We focused on non fiction texts, narrative texts, persuasive and procedural texts. This week we have been learning how to identify, nouns, verbs, adjectives, conjunctions and past, present and future tense. Students have created their own grammar book, by reading through their ‘just right’ books and identifying these words and writing them in their grammar books. These book will be great to refer to in our writer’s workshops to add colorful, fresh, exciting and snappy words. In Writing, we have been moving through the writing cycle to publish a persuasive piece. Past weeks we explored many different types of persuasive texts and began drafting our pieces. This week I have seen some amazing and very convincing published persuasive pieces on topics ranging from getting a class pet, having lollipops every day to wearing casual clothes to school. We have just concluded another brilliant inquiry topic on ‘Weather impacts upon our lives’. Student created some very informative weather reports on their chosen extreme weather. This week we started unpacking our new inquiry topic on ‘Beliefs influence our celebrations’. We are looking into the all different things people celebrate and how people celebrate them. In the future week students will be each choosing a different celebration and creating an invitation for it. Stay tuned to see what magnificent celebrations student come up with. What a fantastic two weeks it has been! I picked 6 flowers. Each flower has 4 petals. How many petals are there altogether? In Writing, we are well on our way with persuasive writing. We looked at lots of different texts and participated in line debating where we shared our arguments about why dogs are better than cats or why we should only have school for two days a week. Each student picked something they felt very strongly about and then thought about who they were trying to persuade. Get ready to check these out as we are up to drafting and revising these pieces now. In Inquiry, the grade 1/2 students became weather reporters. They did an exceptional job and the teachers discovered some budding journalists. The students enjoyed this Inquiry and were very excited to watch each others reports and celebrate in the learning of others! All year 1/2 students and teachers had a wonderful night! We got to play some exciting games and have a boogie at the disco. The year 2s had a fun night walk and watched Miss McKinley’s favourite childhood movie ‘The Land Before Time’. Everyone went to bed straight away but there were snores galore. We learned that Mr. Richards could cook a great BBQ, Miss Ricthie and Mr. Pidd have awesome dance moves, Miss Murray is a DJ extraordinaire and Mrs. Marinelli can plan a great sleepover. Miss McKinley and the 1/2 Team. And that’s a wrap, what a fantastic eventful term it has been, filled with loads of excellent learning, swimming, Student Led Conferences, Book Week and lots more! Before we get stuck into some well deserved holidays let's look at our great learning from the past 2 weeks. In Maths, we have been working on place value, learning how to read, write and order numbers. Students have been working hard on ordering numbers from the smallest to the largest number, adding and subtracting 10 and 100, and representing Just Right numbers in different ways. Some of the ways we explored were: writing it in words, expanded form (e.g. 123-100+20+3) and making it with materials such as MAB blocks. Students also worked on estimating where numbers would land on blank number lines. How many numbers can you find at home that you can order? How many numbers can you make with a 2 in it? In Reading, we have been working on improving our reading fluency. The 4 keys to reading fluently are accuracy, rate, expression and punctuation. When reading accurately we are reading our words correctly. To read with good rate we need to make sure we are not reading too fast and not too slow. To make our reading interesting and add more meaning we need to use expression. A big part of expression is changing our voice when reading things that characters are saying. When reading it is very important to follow all punctuation as this helps to understand what we are reading by linking and separating different ideas within our stories. A good way to develop reading fluency is with a familiar book that you know well and find easy to read because then your main focus is not on decoding the words and allowing you to focus on the 4 keys of fluency instead. Remember fluency helps us to understand what we are reading and makes our stories come to life. In Inquiry we have continued to explore our topic, ‘Weather impacts upon our lives’. We have undertaken further research into the four seasons and extreme weather. Whilst researching students have been listing questions they have and recording the interesting things they have learnt from their research. 1/2B, 1/2P and 1/2R have had a successful couple of weeks at swimming and all Grade 1/2s that participated have further developed their swimming skills which is fantastic as we get closer to the summer months when we are likely to be in and around water more. *Please don’t forget we have our 1/2 BBQ/sleepover on the second week back in term 4. It’s going to a fun night and a great stepping stone into overnight camps. Have a safe holiday and we look forward to seeing you in term 4. Mrs Marinelli and the 1/2 Team. Wow! What an amazing fortnight it has been. The students were very busy last week preparing and implementing their Student Led Conferences. It was so wonderful to watch all the students share their learning with their special person. We also had Book Week in week 7 and we were fortunate enough to have grade 6 students come into our class and read a story to us at eating time each day for the week. All the student looked incredible in their costumes! This week we have revisited two dimensional and three dimensional shapes, specifically learning how to transform them to make patterns and tessellations. We have explored the different tessellations that are around our school, including bricks and soccer ball pattern. We have created different tessellations with wooden shapes using the methods of flip, slide or turn. Do you have any tessellations in or around your house? What do you think we have been learning in Reader’s Workshop this week? Well, we have been learning how to ask deeper questions. Questioning helps by deepening our understanding of a text. There are so many ways to question, but here are a few that the students have used this fortnight; 4 levels of questioning (Robot, Detective, Judge and Inventor), reverse questions where you have an answer and think of all the questions and questioning before, during and after a text. This week the students used the ‘menu’ for questioning again. They love the independence and choice it enables them to have in their learning. In Writing, we have been moving through the writing cycle learning how to publish a letter. Last week we explored many different types of letter styles. Thanks to Australia Post we now have a great understanding of how to write a personal letter and what to we can add including; interesting things that have happened at school, sports team, friends, a holiday, birthday, achievements and questions. http://auspost.com.au/education/letterwriting/students/personal-letters.html. With Father’s Day coming up this week maybe you could write a letter to your Dad or Grandpa? We have started unpacking our new inquiry topic on ‘Weather impacts upon our lives’. We are looking into the all different types of weather we have not only in Australia, but the world. We are also exploring the different seasons in Australia which ties in nicely to the start of spring. Don’t forget week 9 is the start of swimming lessons for 1/2B, 1/2P and 1/2R at Bellarine Aquatic and Sports Centre. These are very busy times, not just in the 1/2 team, but across the whole school as we prepare for Student Led Conferences this coming Tuesday August 23rd! We hope to see as many of you there and can't wait to share our learning with you. Below are some other things we've been up to for the past fortnight. In Maths we've been learning how to read, record and display data. This has involved selecting some good questions we could survey the rest of the class about, gathering their responses using tally marks and then finally, graphing the data in a column graph. This week we've also been revisiting the operations of addition and subtraction. There have been many worded problems to solve using a range of strategies like counting on, 10s facts, doubling, adding 10 and so on. It's been a great opportunity to jump (feet first) into the Learning Pit, problem solve our way out and learn! See if you can solve this problem together: ? + ? + ? = 27. Reply in the comments if you have a solution! This past fortnight we've been learning how to make predictions in our Reader's Workshop time. We have talked about how predicting helps us to be better readers because we "stay tuned" and want to know what happens next. You can predict before, during and after reading. The best way to predict is by using your schema (what we already know and have experienced) and the clues in the text to make a smart guess. Students have again used a "menu" of activities for reading tasks so that there is more choice in the different types of activities we do. The next time you're reading a new book, maybe you could make some predictions about what the book will be about and what will happen next. Writer's Workshop sessions have involved revising, editing and publishing our fantastic picture story books. These are coming along very nicely and we are doing the best writing we can so that our readers can enjoy the stories when we're finished! It's great to see some of the fantastic ideas of important and interesting moments from our Writer's Notebooks be developed into imaginative stories. Perhaps you might like to write another picture story book at home. This time has been spent refining our posters/brochures on Maps and Geography and also in preparation for Student Led Conferences next week. Welcome back to Term 3 and hopefully we are all settled back into the swing of things. 1/2M and 1/2K had a thrilling fortnight participating in swimming lessons. They rode the bus all the way to the Ocean Grove pool and tried their hardest in their swimming lessons. They did a fantastic job and even got to do some diving and play on the playground. So lucky! 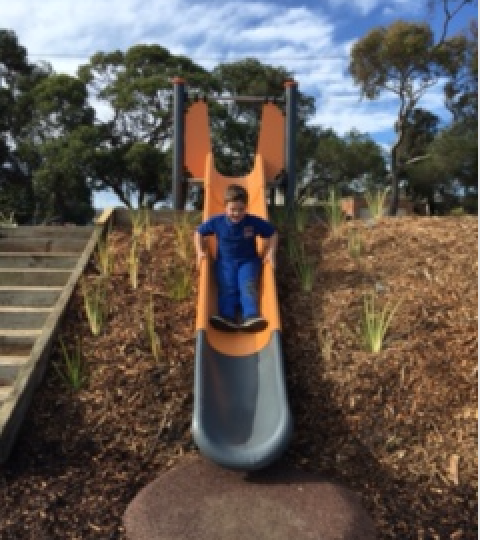 While 1/2M and 1/2K were swimming 1/2B, 1/2P and 1/2R had the privilege of being the VERY FIRST children to play on the new playground on Jetty Rd. It was fantastic and we had an absolute ball. 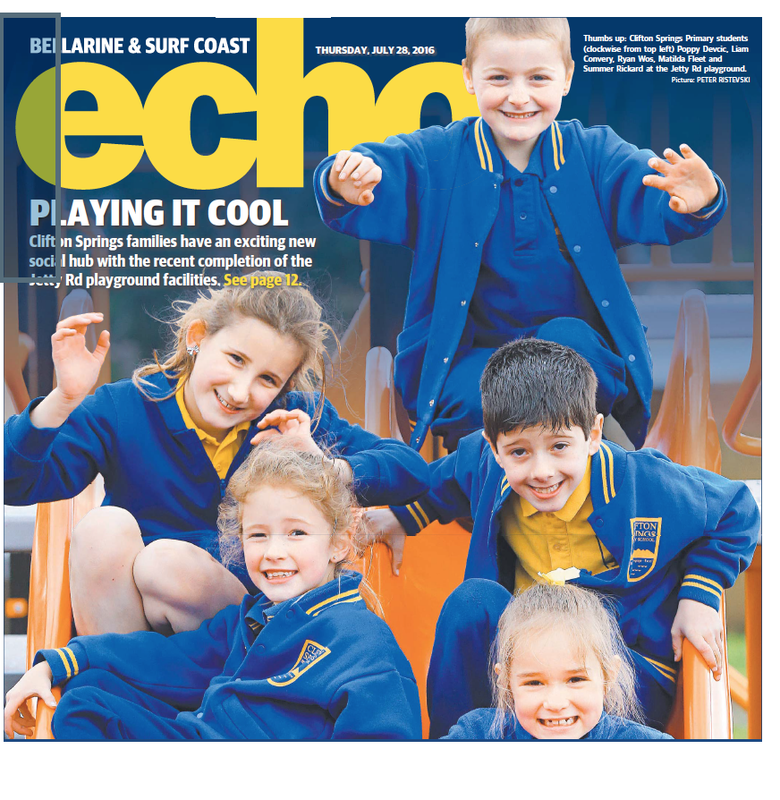 We had photos taken for the paper and even tried out the super cool flying fox. We made C.S.P.S. proud by showing our School Values perfectly. In Maths we have looked at multiplication and division, measuring mass and time. We use the strategies of skip counting and arrays to solve multiplication and division problems. Skip counting is a quick and great activity to be done at anytime of the day. We were so excited to get the balance scales out to weigh, order and compare a variety of objects. All 1/2 classes became experts at hefting and were even measured a variety of weights, such as 500grams and 1kilogram. While learning about time we have really focused on using the long hand to identify how many minutes past a time is. We use our 5 skip counting pattern to assist us to tell the time. http://www.visnos.com/demos/clock This is a great website to help us learn how to tell the time. It shows analogue and digital and is easy to manipulate. In Reading we have looked at Visualising. As a cohort the 1/2s are excellent at visualising what they have read or a text shared with the whole class. We spent the first week revising some strategies we have used earlier on in the year and extended our great Purposeful Reading Tasks (PRT). This last week we have been using a Visualising Menu to select our own PRT. We still have a mini lesson where we focus on a strategy and share a book and discussion as a whole class, but now the students are responsible for the activity they would like to do and will challenge them to learn something new. This is very exciting and all students are doing a terrific job at this. In Writing we have started a new writing cycle. The 1/2s are now writing picture story books. We have looked at a plethora of picture story books, like Miss McKinley’s favourite Olga the Brolga by Rod Clement. We have been planning and developing our ideas. All students have drafted and have written a beginning, middle and end that must include a problem and solution. Stay tuned to see our published pieces soon. http://www.storylineonline.net/ This is a fantastic website where people from the Screen Actors Guild read some of our favourite storybooks. Worth a look! During Inquiry, we have continued to investigate our exciting topic of ‘Maps and Geography’. We have been lucky to link our exploration of maps and the world to the Olympics. Students have made brochures based on a country they have researched. They have included facts, pictures and maps. Congratulations 1/2s on a fantastic start to term 3! Buon journo to all our 1/2 families and friends! We have been busy again this past fortnight, learning about Addition and Subtraction. We have looked at how to solve simple addition and subtraction problems using a range of efficient mental and written strategies. Students have been counting on, using their number facts and learning to bridge to 10. We have played many learning games such as ‘Race to Zero’ and got competitive with ‘Addition Spinners’. Students in all classes did a superb job of solving Addition and Subtraction problems using counters, 100s charts, number lines and other mental strategies like doubles and near doubles. Many students showed innovation as they challenged themselves and their classmates. In Reading we have looked at Making Connections. 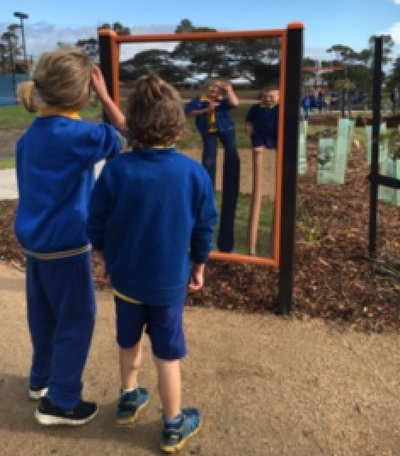 Our 1/2 students have shown their ability to confidently discuss and make ‘Text to Self’, ‘Text to Text’ and ‘Text to World’ connections. We have looked at a variety of texts ranging from fairy tales, to non fiction texts, helping us make strong meaningful connections to what we are reading. We have learnt that making connections allows us to gain a deeper understanding of our books. In Writing we have introduced a new Writing Cycle focused on writing a non fiction text. Each student has selected a topic of interest and they have started to draft, revise and edit their topic of choice. This has been a fantastic opportunity for students to select an area they are interested in and delve into researching. Student topics have ranged from flowers and guinea pigs, to why sleep is important. During Inquiry, we have commenced our new exciting topic of ‘Maps and Geography’. Students are beginning to understand and inquire into how ‘Maps and Geography help people to understand their location in the world’. Students have been thinking about where they are in relation to the wider world. Students have started exploring different maps and countries of interest. Well done 1/2 students on a very productive fortnight's worth of acquiring new learning!